The Bellas reunite and go on a USO tour. It turns out, one of the bands competing on tour will be chosen to open for DJ Khaled for a big televised event that could skyrocket their career. It is a little hard to imagine what is left for the Bellas. They have already won the collegiate acapella championships and the world acapella championships, so what else is there? Apparently, that's what we are here to find out. 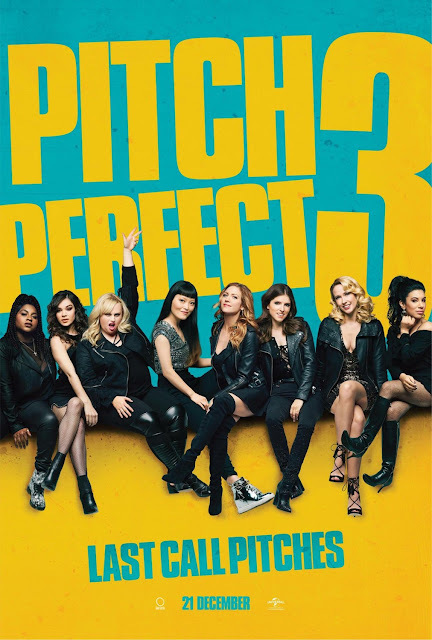 "Pitch Perfect 3" is directed by Trish Sie, who has taken over the directorial duties from Elizabeth Banks, who decided to step aside for this installment. Sie has directed "Step Up: All In" and a bunch of music videos, which we guess is a good background for a movie that is basically a bunch of music videos slapped together with a flimsy plot. The main cast returns to reprise their roles as the Bellas including Anna Kendrick, Rebel Wilson, Brittany Snow, Hailee Steinfeld, Ester Dean, Anna Camp, Chrissie Fit, and Hana Mae Lee. Also returning are Elizabeth Banks and John Michael Higgins as Gail and John, the Bellas own personal commentators and hecklers who are now making a documentary about their rise and fall, emphasis on the fall. Noticeably missing are Fat Amy's former love interest Bumper, played by Adam Devine, and Beca's former love interest Jesse, starring Skylar Astin, who get written off with one quick line early on in the film. Since graduating from college, most of the Bellas have gone on to lead rather unfulfilling careers and lives. Looking for a final hoorah, Aubrey, played by Anna Camp, gets the Bellas a spot on an upcoming USO tour for a reunion. Once they on tour, the women find out one of the groups playing on the tour will get to open for DJ Khaled, turning what was a simple music trip into yet another contest where the Bellas are the underdogs. There is also a subplot about Fat Amy and her fallout with her estranged father, played by John Lithgow with a terrible Australian accent, who may or may not have sinister intentions. So, aca-fans, what do we get from this third (and wholly unnecessary) installment in the "Pitch Perfect" series? Pretty much the exact same thing we got from the two previous films. We get to hear a lot of cover songs sung by various groups, only this time, the bands in the competition have actual musical instruments. The Bellas also go through some sort of strife with each other until they eventually make up and all is well and right with the group because they aren't just singers, they are ~*a family.~* John Michael Higgins makes a bunch of awful but satirical misogynistic remarks, which can be good for a laugh here but are mostly tired at this point in the series. Elizabeth Bank's Gail gets to go on and on and on about how the Bellas are in way over their heads... until they aren't. The story as a whole is very basic and is mostly about the Bellas trying to move on with their lives and finding things to do other than singing. It's clear that most of the people in this series are tired of it. They are clearly in it for the paycheck at this point. Anna Kendrick checked out midway through the second installment, so someone else needs to get more time to shine. If you thought there was a big focus on Fat Amy in the second installment, Rebel Wilson gets even more spotlight in this third installment. While we love seeing the representation of larger women on screen, Fat Amy is only funny in small doses. She gets more and more obnoxious as the movie progresses, especially considering there is a subplot about her relationship with her estranged father. There is also another subplot that has one of the girls doing over the top martial arts fighting against an army of armed thugs because why? The only reason these subplots exist is to keep the series feeling new and exciting. It doesn't work, but that's beside the point. It speaks to the nature of the messy story which is clearly just slapped together around a bunch of pop songs. The best thing about the "Pitch Perfect" series has always been the music and the mashups. The songs are performed well enough that you may be able to enjoy the musical aspects even if the rest of it is a total trash fire. That being said, and we hate to keep picking on her, but Rebel Wilson has gotten more and more off-key over the course of these three movies, and considering the substantial part she plays here, be prepared for a lot of screeching. In the end, there are a couple of moments here that made us laugh, but a lot of humor falls desperately flat. The story itself is flimsy and contrived, but the music and various over the top adventures may be enough for fans of the "Pitch Perfect" franchise to still have a good time. For us, "Pitch Perfect 3" it winds up being a borderline middle of the road film with some good music, a lot of dumb plot points, and a semi-redeemable ending.